Arrive in Istanbul and transfer to our hotel. Tonight we meet as a group for dinner and orientation. This morning, we start with a visit to the Blue Mosque and the Hippodrome. We then board our chartered boat and enjoy a leisurely cruise along the Bosphorus Strait, which connects the Black Sea and the Sea of Marmara. We stop in Ortakoy, a picturesque village just outside Istanbul where we have lunch and time to stroll around. After the boat trip, we visit the spice market and visit the Chora Church to admire the exquisite mosaics and frescoes. Overnight in Istanbul. Today we drive along the Marmara Sea to Assos. Enroute, we stop in Gallipoli and Anzac Bay where a famous Memorial commemorates the Turkish and Allied soldiers that died here in WWI. After lunch we continue to the Dardanelles Strait, where we cross by ferry, observing two 15th century fortresses, one on each side. We visit the UNESCO World Heritage site of ancient Troy and continue on to the fishing village of Assos. Overnight in Assos. This morning we depart for a sightseeing tour of Assos. We visit the Temple of Athena, then continuing our scenic drive by olive groves and along the Aegan Sea to reach the village of Adatepe. Enroute, we visit a family owned olive oil factory and museum. Here we learn about traditional olive oil extraction from the personable people who run the factory. Also today, we visit the Altar of Zeus. Overnight in Ayvalik. 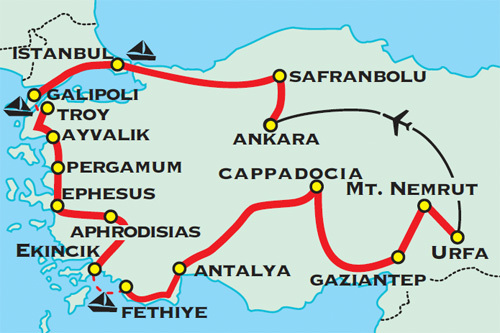 Our journey continues to Selcuk; stopping enroute to visit Pergamum where we explore the Acropolis. Next, we visit Asclepion, an ancient healing center. 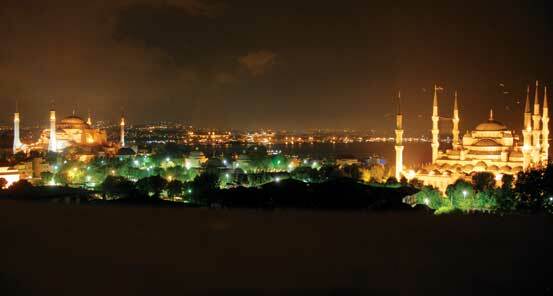 Overnight in Selcuk. 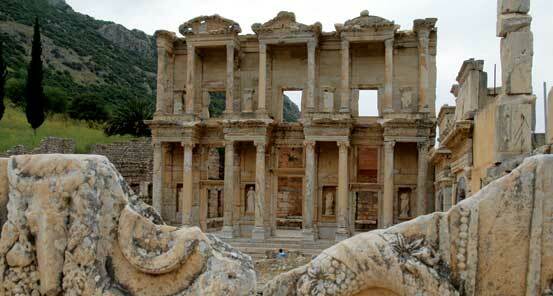 We drive to Ephesus to explore this ancient Greek city which boasts the grandest ruins on the Aegean coast. After lunch, we visit the Ephesus Museum where we can see statues, friezes and artifacts from the site. Overnight in Selcuk. Today we explore the ruins of Aphrodisias and then it's onward to Ekincik where we board our gulet yacht for our 3-day Mediterranean Cruise. Gulets are traditional Turkish yachts that have cabins with private bath. All meals are cooked and served on board. After a brief cruise, we moor in Ekincik Bay, where we stay for the night. On the first day of our Mediterranean adventure, we take an excursion to Caunos, home to the Lycian Rock Tombs, which date back to the 4th century B.C. Throughout our journey, there are opportunities for hiking and swimming along the route. Overnight aboard the gulet. Today, we continue our adventure on the Mediterranean with stops to go ashore. The scenery along the coast is fantastic. Brilliant turquoise waters lap up against limestone cliffs, with water that is perfect for swimming. Overnight aboard the gulet. 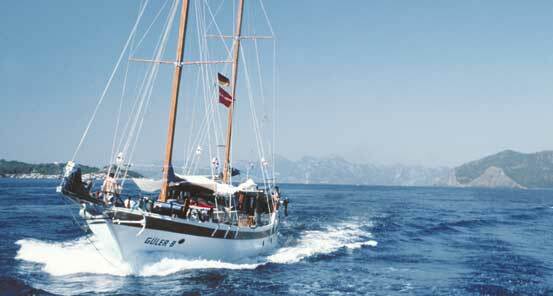 In the morning, we disembark from our gulet at Fethiye and drive to Antalya. Enroute, we view the stunning UNESCO World Heritage site at Xanthos, once the grandest city in all of Lycia. We stop for lunch in Kas. Overnight in Antayla. Today, you have the option of Antalya sightseeing or a day of leisure. For those going sightseeing, we begin with a visit to the archaeological museum followed by a brief walking tour of the old city with its collection of narrow streets and quaint buildings surrounding the old port. The remainder of the time in Antalya is free to explore on your own. Overnight in Antalya. A long scenic drive to Cappadocia, with a stop enroute to see Aspendos - the site of a famous Roman theatre and the city of Konya. Visit Mevlana Museum, famous for Whirling Dervishes. Overnight in Cappadocia. 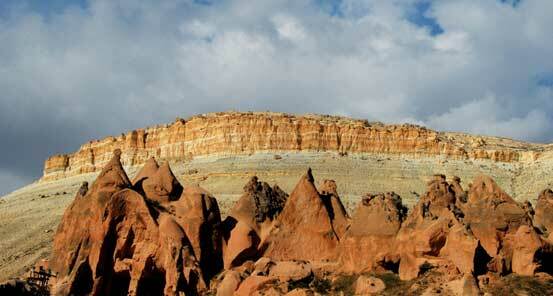 We trek in the moonscape-like valleys that surround Cappadocia - a true natural wonder. The UNESCO World Heritage sites in the Goreme and Urgup Valleys feature secret dwellings carved out by earlier Christians and there are also fantastic towering "fairy chimneys" - formed from eroded volcanic deposits. For those who choose a scenic flight over the picturesque valleys and canyons of the region, we have an option this morning to balloon over Cappadocia. We hike through the Zelve Valley and overnight in Cappadocia. Cappadocia is an area of extreme beauty, combining a dramatic nature with a fascinating culture and history. Hittites, Byzantines and early Christians established important landmarks here, as did mother nature with her stunning erosion of the soft volcanic deposits. The deep canyons and lush fertile valleys provide our balloons with an ideal playground for a unique and memorable flight. Gentle winds carry us over places that could never be reached except by balloon. Join us for the flight of your life. Please note: This option is not included in the tour price. Today, we visit the underground city of Kaymakli. For those keen to hike, we offer an adventure option of hiking in the Ihlara Gorge. It's a spectacular walk that takes you down into a gorge known for its hundreds of churches and mosaics that are carved into the gorge walls. Today we leave the magical environment of Cappadocia as we drive to Gaziantep. Enroute, we stop in Tarsus, an ancient city on the alluvial plain of ancient Cilicia and the birthplace of Paul the Apostle. With a history dating back over 6,000 years, Tarsus was an important stop for traders and a focal point of many civilizations. During the Roman Empire, Tarsus was the capital of the province of Cilicia and was the scene of the first meeting between Mark Antony and Cleopatra. We continue to Gaziantep for dinner and overnight. A UNESCO World Heritage Site, Mt. Nemrut standing 2,134 (7,001 ft), is believed to be the burial site of King Antiochus I, in 62 BC. Although the actual grave has never been found, today's attraction is two sets of giant heads, one viewing sunset and one viewing sunrise. The mysterious and impressive heads are not easy to reach, but the rewards are great. Each set of heads represent the gods of Zeus, Apollo, Hercules, the goddess Kommagene and King Antioch, having placed himself in such elite company. These heads are flanked by a lion and an eagle. After a relaxing morning and lunch, we depart for Nemrut. Enroute, we make stops at a Roman bridge, four ancient pillars and a stone relief, which are dotted through the spectacular countryside surrounding Mt. Nemrut, including a fortress perched on a vertical mount just before we start our driving assent. We will have plenty of time to take in the scenery, the mystery and the aura of Mt. 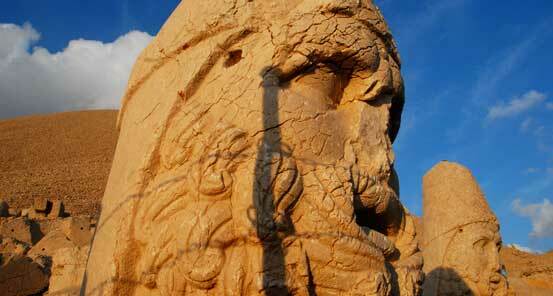 Nemrut, as we stay until sunset, the perfect way to bid farewell to the ancient gods sitting atop Mt. Nemrut for over two thousand years. We make our way to Kahta for dinner and overnight. After breakfast, we depart for Urfa, the birth place of Abraham. Enroute we will have the opportunity to view Gobekli Tepe (Potbelly Hill) perhaps the oldest known human made religious structure likely 12,000 years old. Urfa is an important pilgrimage site for Jews, Christians and Muslims. We will visit the cave where Abraham was born, as well as spend some time at the hilltop ruins, mosque and surrounding park with its holy lake. Because the site attracts people from all over the world, one can enjoy some delicious Turkish tea by the lakeside and relax just people watching. Later in the afternoon, we will catch a flight to Ankara where we will overnight. This morning, we visit the renowned Museum of Anatolian Civilizations. This is Ankara's premier museum and a must-see for anyone interested in Turkey's ancient past. The museum is housed in a restored covered market built by the order of Grand Vizier Mahmut Pasa in 1471. The museum is often referred to as one of the world's great museums. After lunch we continue driving to Safranbolu, a unique and well preserved Ottoman town located in the inner Black Sea region. Dinner and overnight in Safranbolu. After breakfast, we enjoy time in the charming little town of Safranbolu, a UNESCO World Heritage site. A leisurely stroll through the lovely winding cobblestone streets brings us views of local artisans working, little shops with interesting crafts and, of course, the 200-year-old wooden Ottoman houses for which this town is famous. A welcome respite before we drive back to the excitement of the big city - Istanbul, for dinner and overnight. After a traditional Turkish breakfast, we explore the UNESCO World Heritage sites of Old Istanbul, a symbolic city of eastern culture, on foot. We visit the Yerebatan Cistern (an underground cistern) and continue to the Topkapi Palace, the residence of Ottoman Sultans for almost 400 years. Our next site of interest is the Haghia Sophia, one of the most magnificent museums in the world. In the afternoon we explore the Grand Bazaar. Farewell dinner and overnight in Istanbul. Transfer to Istanbul airport for departing flights homeward.